An engaging social campaign speaking playfully about a serious problem. Prostate cancer is the third – following lung and colorectal cancers – most frequent cancer among Polish men. With an early diagnosis, it is fully curable, yet still it kills four thousand Poles every year. One reason for this high fatality rate is too late diagnosis. The TNT movie channel described the problem in a truly cinematic style. Over 700 photos posted in the application by over 500 people. PLN 15,000 collected and donated to the Rak'n'Roll Foundation for preventative tests conducted by the Badaj prostate cancer prevention programme. Soon after the application's launch, the campaign was ranked among the most interesting advertisements of the week by the wirtualnemedia.pl portal. A TV movie channel – social media – CRS actions How to smartly engage a TV brand in the area of Corporate Social Responsibility? So that the results are measurable, and all the actions are consistent with the existing communications of the brand? That was the challenge we took on in this project. We joined the annual international “Movember” campaign, which was communicated under the Polish name “Wąstopad”. The primary objective of the campaign is to raise the awareness of prostate cancer and encourage men to undergo regular screening. We invited Adam “Nergal” Darski to be the ambassador of the campaign. The movie channel, in a specially designed application available on TNT Polska’s Facebook fan page, encouraged men to grow a moustache and post a photo of their moustached self. 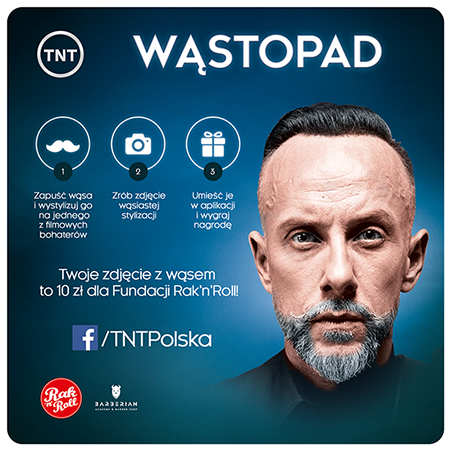 For every photo posted, TNT donated PLN 10 to the Rak’n’Roll Foundation. This amount was increased to PLN 50 in the last week of the campaign. The money collected and donated to the Rak’n’Roll Foundation was used to support the financing of urological consultations for men, as a part of the Gadaj*Badaj programme. The campaign was accompanied by a competition, in which the owners of the five best movie-style moustaches won a styling service in the Barberian Academy & Barber Shop, a barber salon owned by Adam “Nergal” Darski. Moreover, TNT used the “Movember” campaign to screen well known movies with moustached leading role actors, including “Smokey and the Bandit”, “Shaft”, and “Bowfinger”. The movies were screened in a specially created series “Movember in TNT” and were intended to inspire viewers to grow a movie-style moustache; as was the picture gallery of the popular application.